About 1,771 he purchased Marybone gardens, for which | he composed some excellent burlettas and other pieces, to which he added some ingenious fire-works. This scheme succeeded; but in 1776, the lease of the gardens expired, and they were let for the purposes of building. We find Dr. Arnold afterwards employed by Mr. Colman, then manager of Covent-garden, as musical composer, and when he purchased the Haymarket theatre, Dr. Arnold was there engaged in the same capacity, and continued in it for life. 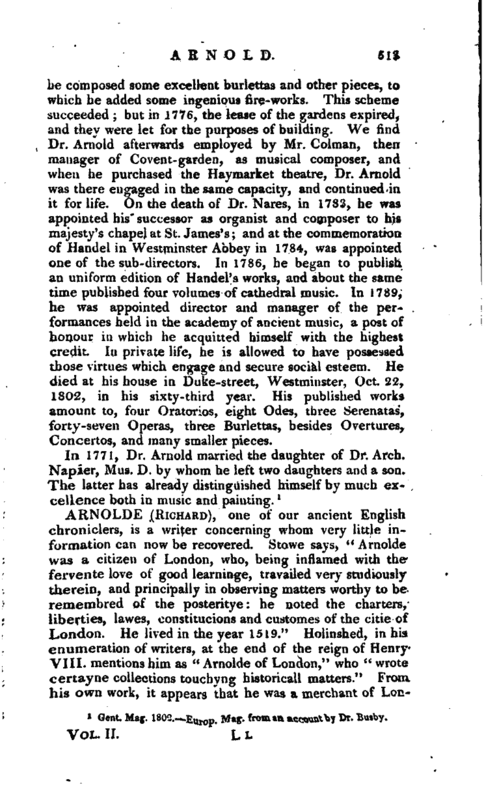 On the death of Dr. Nares, in 1783, he was appointed his successor as organist and composer to his majesty’s chapel at St. James’s; and at the commemoration of Handel in Westminster Abbey in 1784, was appointed one of the sub-directors. In 1786, he beu,an to publish an uniform edition of Handel’s works, and about the same time published four volumes of cathedral music. 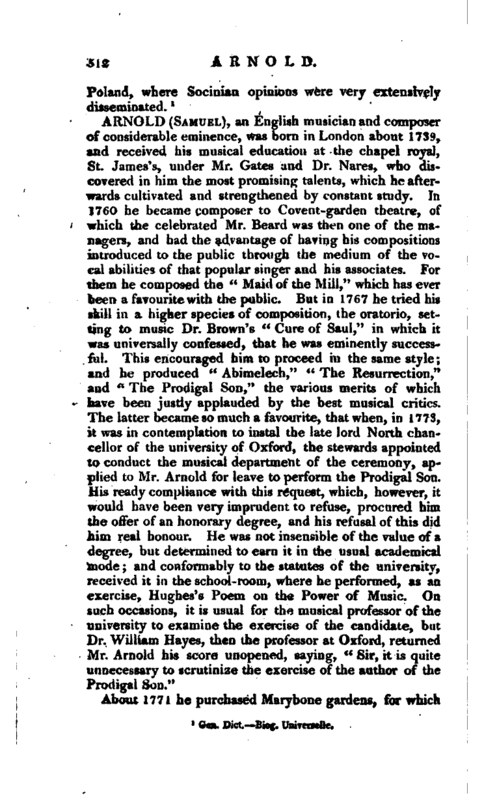 In 1789, he was appointed director and manager of the performances held in the academy of ancient music, a post of honour in which he acquitted himself with the highest credit. In private life, he is allowed to have possessed those virtues which engage' and secure social esteem. He died at his house in Duke-street, Westminster, Oct. 22, 1802, in his sixty-third year. His published works amount to, four Oratorios, eight Odes, three Serenatas, forty-seven Operas, three Burlettas, besides Overtures, Concertos, and many smaller pieces. Gent. Mag. 1802. Europ. Mag-, from an account by Dr. Busby.